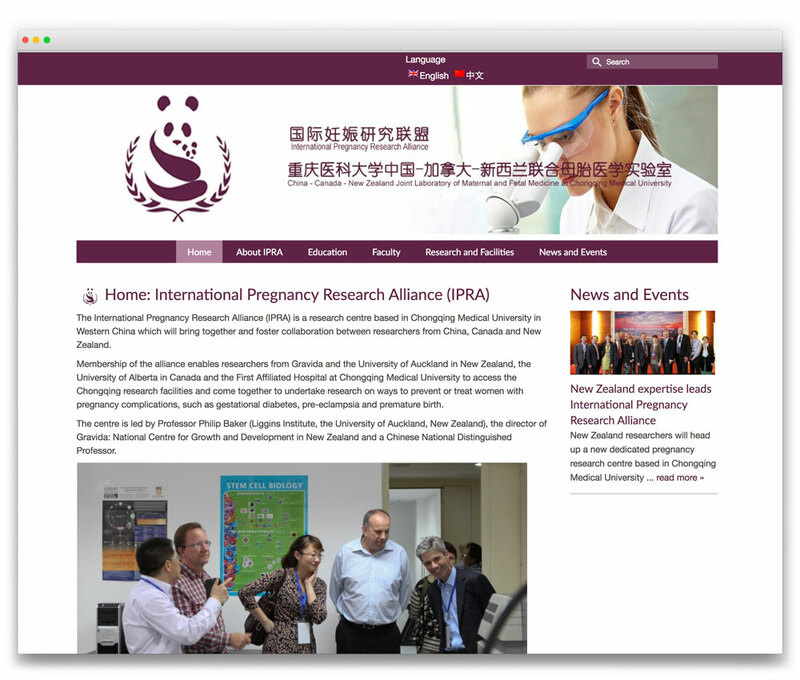 BRIEF: To develop a Chinese and English language website for a new dedicated pregnancy research alliance between Gravida and the University of Auckland in New Zealand, the University of Alberta in Canada and the First Affiliated Hospital at Chongqing Medical University. The alliance’s researchers focus on discovering new ways to prevent and treat pregnancy complications such as gestational diabetes, pre-eclampsia and premature birth. SOLUTION: We developed a responsive WordPress content management system incorporating the user-friendly multilingual functionality of Qian Qin’s mqTranslate software so that visitors can switch between languages. We also set it up with all the other functionality that was required, and uploaded all content including translations provided by the Alliance Partners. OUTCOME: An attractive website that meets the requirements of the International Pregnancy Research Alliance.